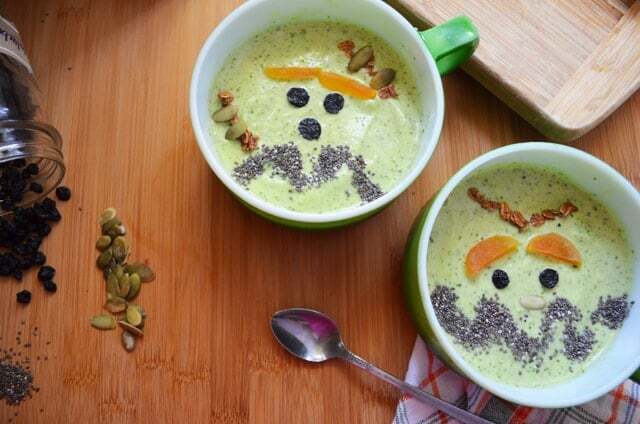 These smoothie bowls for breakfast are a healthy way to start the day, any time of year! But especially, Halloween! I am not trendy. Especially when it comes to food. This is not a character flaw. I’m just really infatuated with cheap and accessible foods like bananas, carrots, and sweet potatoes. However, I have taken notice of Smoothie Bowls. They always look gorgeous. In addition to being works of art (which is tricky with a baby on my hip), the ones that fly around my feed usually have a list of superfood ingredients that have been selected from a deep jungle using special harvesting techniques. So I just smile and scroll. 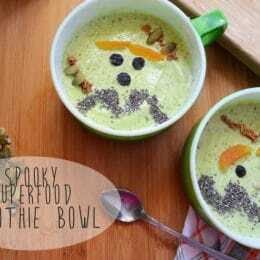 But I secretly wanted to create a smoothie bowl for Halloween that resembled a monster. Maybe, just maybe, a regular non-trendy me could create a smoothie bowl. I experimented with smoothie bowls and enjoyed the heck out of them. They are so versatile and more satisfying than a regular smoothie. My tiny goblins also enjoy the heck out of them. The key to a satisfying smoothie bowl is to have a thick smoothie loaded with your favorite crunchy and chewy bites. Here’s what I did to make these perfect for October. I made one batch of smoothie bowls with mangoes + banana for a nice orange tint and a round of spinach + pineapple + banana for a green tint. I used a food processor or blender to get a uniformly smooth texture. Check out the Halloween-inspired ingredients I pulled from my freezer and pantry. (Note: A few years ago my dear brother bought chia seeds for me. He asked if I was using them in my cooking and I said, “No. They’re too trendy.” I promptly received a package in the mail with a large bag of CHIA SEEDS!) I know if you dig around your pantry you’re bound to find some amazing ingredients that are blueish, blackish, orange, or green. 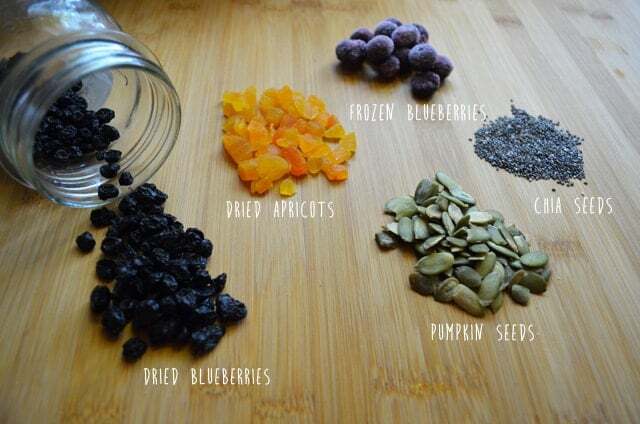 My picks for my Spooky Superfood Smoothie Bowls are dried and frozen blueberries, dried apricots, pumpkin and chia seeds. The pumpkin seeds make perfect fangs or part of the stitches on Frankenstein’s face! Use kitchen shears to cut your bigger dried fruit into nice shapes. I loved making eyelids and eyebrows with my dried apricots using the shears. Cut a corner off a snack-sized plastic bag to get those unruly chia seeds in place. 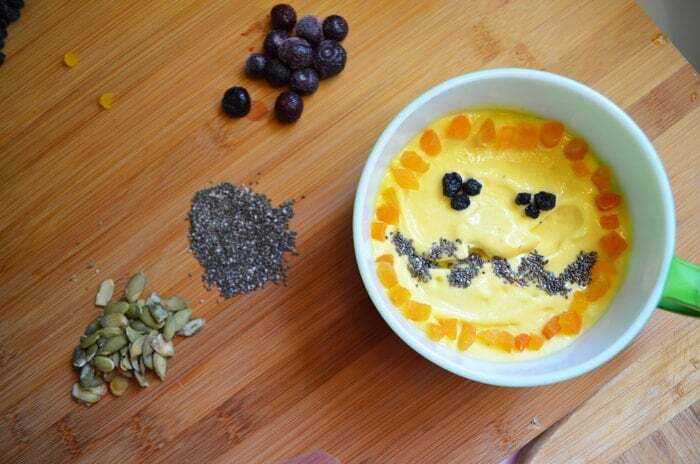 Smooth out the surface of your smoothie bowl with the back of a spoon before adding any “face parts.” Think of it like smoothing out your canvas. Then your seeds and fruits won’t go rolling away while you’re making the face. Get your kids involved with creating the faces. They have brilliant imaginations and will get a kick out of making MONSTERS in their breakfast. Don’t tell anyone, but smoothie bowls are a trend that I love. Check out another crazy-easy Halloween activity here that uses veggies! Alli blogs at Don’t Panic Mom where she trades panic for a fun, positive approach to family health. She’s living the dream with her four kids, hunky husband, and backyard chickens in eastern Colorado. Peel banana. Blend ingredients in a food processor or blender until it’s uniformly smooth. You’ll need to stop a few times to push down the spinach leaves. Add more milk as needed. 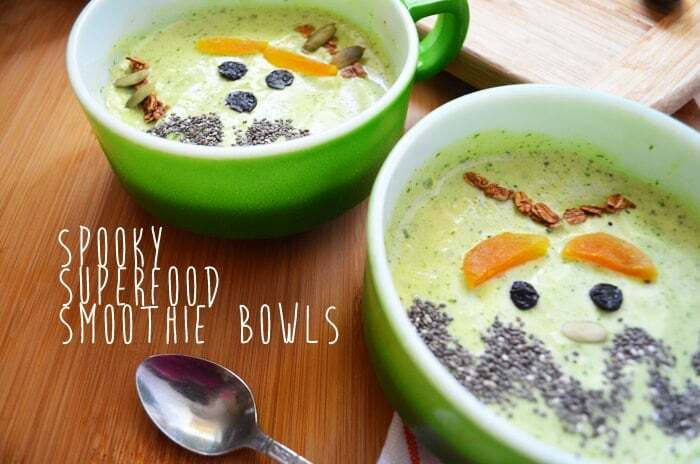 Spoon into bowls and add your spooky superfood toppings like dried and frozen blueberries, dried apricots, pumpkin and chia seeds. Yields 4 smoothie bowls. Peel banana. Blend ingredients in a food processor or blender until it’s uniformly smooth. Add more milk as needed. My ratios may have been off since I used what I had on hand, but this wasn’t a win with my kids.